As we were debating how to build more transmitter sites without actually having any more staff a proposition came from the United States ambassador. Would we be willing to host a transmitter close to the Rhodesian (Zimbabwean) border to fill in a major gap in the African coverage of the Voice of America? We started negotiations. They were occasionally somewhat strained, as we insisted on a fair exchange of aid and training in return for the use of a very large area of land and the "importation" of around thirty staff. Indeed, we couldn't quite see why so many were needed - and especially why they'd need diplomatic status! - but Botswana was apparently considered to be a "hardship" post necessitating incentives for the technicians. Presumably they would all work very short hours. The site offered was at Selebi-Phikwe, a medium-sized mining town close to the eastern border with (then) Rhodesia. The medium-wave transmitter would carry Voice of America programmes during darkness, but we negotiated daytime use by Radio Botswana. We made several trips to Selebi-Phikwe. It was a sensitive time politically, with frequent intrusions from across the border and a nervous presence by the Botswana Defence Force. On one occasion we were visiting the local District Commissioner and Planning Office. After we'd been there about 15 minutes the door burst open and two rather agitated soldiers demanded all our documents and - particularly - the cameras carried by the two Americans I was accompanying. It transpired that they had been spotted earlier in the day taking a photograph of the Selebi-Phikwe shopping mall from a conveniently high staircase. Unfortunately one of the soldiers had just peeked round a corner at the moment the photograph was taken. It didn't matter that he must have been a hundred yards away at the time, on the other side of the mall. It didn't matter that we were in the middle of some quite delicate negotiations and the Americans had diplomatic passports. The rules said that you weren't allowed to take pictures of the BDF so the cameras had to be destroyed. The soldiers said we were fortunate that they would limit their intervention to that. In the end, after I made some frantic calls back to the Office of the President, we agreed to give up the offending film. But it was a salutary reminder that - despite the peace that was all around us - there was a violent civil war being conducted less than a hundred miles away. 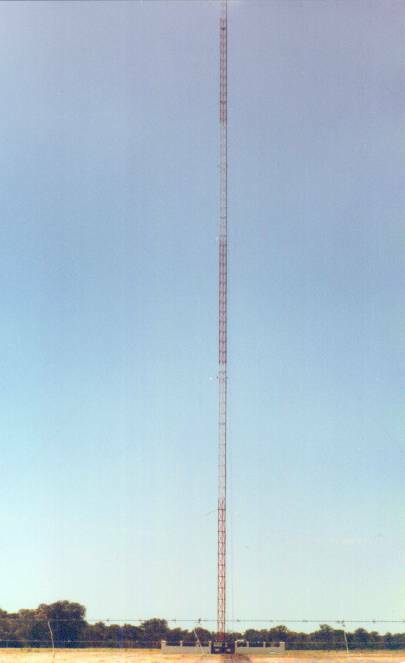 The massive 648 kHz mast at Selebi-Phikwe Eventually in early 1980 we signed the agreement, celebrating it with tea and champagne at the home of the American ambassador, and construction started. 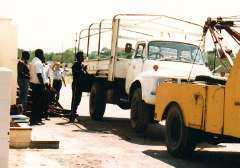 Radio Botswana built the road to the site, VOA built the rest. Soon a piece of America started to sprout in Selebi-Phikwe. The VOA transmitter was quite successful, and we were particularly pleased with the additional daytime coverage for Radio Botswana. 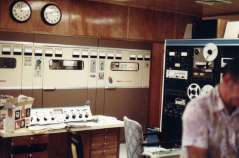 Initially it rebroadcast the shortwave signal from Gaborone. As I left Botswana 4 years later, negotiations were underway to add shortwave broadcasting to the Selebi-Phikwe site. The BBC were also very interested and later editions of "The World Radio and TV Handbook" bear witness to the expansion which subsequently took place. In due course the medium wave transmitter was given to Radio Botswana, having served its purpose. It was one more step towards the plan (see map 4) we'd devised in 1978. Back to front page . . .